Slippery Rock community members on Thursday got a chance to check out the two options designed for the space where the former First National Bank building now stands. 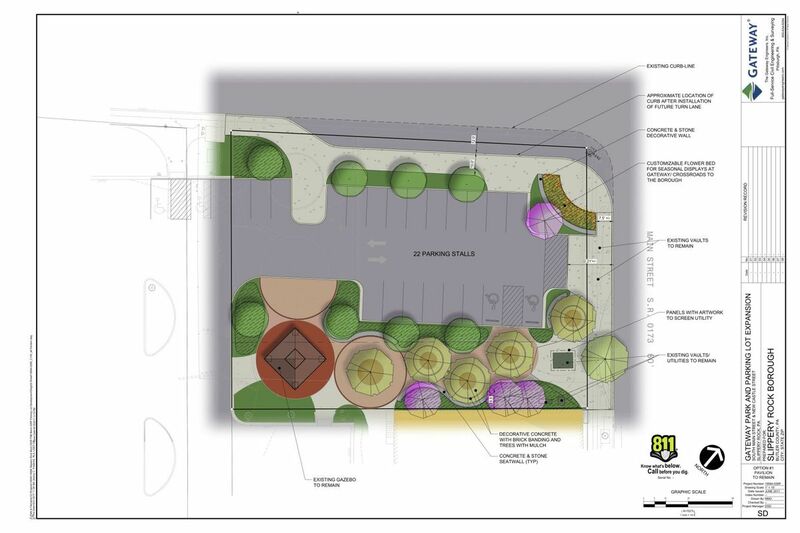 Those in attendance at the special council meeting seemed to be in favor of the first option for the area known as “Gateway Park.” It includes 22 parking spots and a planting bed at the corner of New Castle and Main streets, and leaves the gazebo in its current location. The second option is similar, but shows 20 angled parking spots and moves the gazebo closer to the road at New Castle and Main, said Nicole Oeler, a landscape architect with Gateway Engineers Inc., the borough’s engineering firm. The $732,819 project calls for demolishing the vacant building, which the borough has purchased, and adding more parking and a small park – that would be in addition to the public parking area that is already behind the building. Demolition is expected to start in early 2018, said John Trant, project manager. In the meantime, borough officials are gathering input and exploring their funding options. They already have a $450,000 loan from NextTier Bank, and they’re seeking additional financing from the U.S. Department of Agriculture, which requires the borough to attempt to secure funding from other sources before the USDA application is processed. Both designs feature low-maintenance landscaping, shade trees, seat walls or benches, and decorative paving or colored concrete. There was also talk of a “Welcome to Slippery Rock” sign and a “right-turn only” lane going from New Castle to South Main Street. The engineers will also have to work around a transformer that sits in one corner of the property, and they expect to relocate the James Myford sculpture and protect the engraved bricks that people have purchased over the years, Oeler said. She said that the engineers initially preferred the second option because the parking area would have a better flow for traffic, and moving the gazebo would make the park more visible. Council Vice President Ken Harris said the gazebo is often used for meetings and events, so moving it closer to the road may not be ideal. Resident Chuck Brochetti wondered about safety concerns if the gazebo was closer to traffic, and council member Bob Bowser said the first option allows for two more parking spots. “It would be way too noisy,” resident Jan Forrest said of moving the gazebo. Dan Deiseroth, a Gateway project engineer and the company’s executive vice president, noted that the gazebo, sidewalks, bricks and other items will be protected during demolition; that will cost about $36,000. Demolition is estimated at $230,000, and the asbestos survey did not look “too bad,” he said. Council member Royce Lorentz asked what would happen if the borough cannot fund more parking. The borough could do just demolition and grass, Trant said. Council also heard from Slippery Rock University representatives. Dr. Amir Mohammadi, SRU’s vice president for finance, administrative affairs and advancement services, and the chief financial officer, said that SRU expects to have its largest enrollment ever with the upcoming fall semester. Parking on campus is getting tight, and parents and students complain about traffic in town. SRU is hoping to work with council on those issues, he said. Bob McCafferty, owner of North County Brewing Company on South Main Street, said he liked the first design because it is a good opportunity for more parking, and seems more event and and community friendly. Next up: then engineers will tweak the designs based on Thursday’s discussion, and council will select one of the options at a meeting in the near future.